Evan Spiegel, the 27-year old cofounder and CEO of Snapchat's parent company, is often billed as a visionary. But now Spiegel seems to be admitting to some significant flaws in his vision. After Snap (SNAP) released its earnings report on Tuesday, Spiegel got on a conference call with analysts and acknowledged a series of mistakes and shortcomings. In no particular order: The messaging app is too difficult to use. The company hasn't done enough to attract users on Android, the dominant platform in many international markets. And its transition to an automated advertising system has been bumpier than expected for sales. 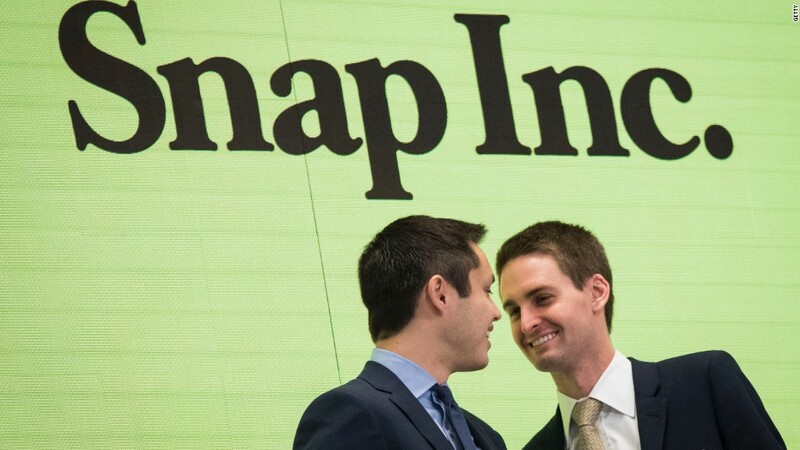 The problems were evident in Snap's dismal third quarter results. Its losses more than tripled, sales fell short of Wall Street's estimates and the audience has flatlined. Snapchat added just 4.5 million new daily active users in the three month period. Spiegel is now planning to redesign the Snapchat app. Or to put that another way: Snap is planning a massive overhaul of its core product and primary moneymaker just eight months after it raised billions in a public offering. Call it the corporate equivalent of a Hail Mary pass. "There is a strong likelihood that the redesign of our application will be disruptive to our business in the short term, and we don't yet know how the behavior of our community will change when they begin to use our updated application," Spiegel said on the call. The stock dipped as much as 20% in after hours trading Tuesday. Snap pared its losses somewhat Wednesday on news of Chinese tech giant Tencent amassing a 10% stake in the company, but shares were still down 15% in early trading. So how could Snap and Spiegel have gotten it so wrong? The answer may be a mix of hubris and shortsightedness. Consider Spiegel's response to yet another setback: Spectacles. The smart sunglasses marked Snap's first foray into hardware and enjoyed some buzz early on. But on Tuesday, Snap said it was taking a nearly $40 million writedown for excess inventory of the product after misjudging demand. "We were very excited about Spectacles by the initial reception, [and] because we were so excited we made I guess the wrong decision," Spiegel said on the call. "Ultimately, we weren't able to sell as many Spectacles as we thought we had been able to based on our early adoption." Even those who remain positive on the company suggest its leadership has been in some form of denial until now. "We wouldn't be so quick to write off Snap just yet," James Cakmak, an analyst with Monness, Crespi Hardt, wrote in an investor note Wednesday. "We believe this is the first time the company is fully self-aware by acknowledging and appreciating the points of friction."